The Tragically Hip, Blue Rodeo, Ron Sexsmith, Cowboy Junkies and Bruce Cockburn are among the artists who have recorded Lightfoot songs for the first-ever salute to Canada's premier songwriter. 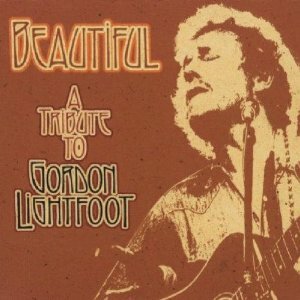 Borealis Records, Canada's pre-eminent folk/roots label and NorthernBlues, Canada's cutting-edge blues label have combined forces to release 'Beautiful: A Tribute to Gordon Lightfoot.' The upcoming album will be released in Canada, the United States, and a number of overseas markets, in Autumn, 2003. Some of North America's best-known roots and blues artists produced and recorded their own interpretations of some of Lightfoot's best-known songs. The Cowboy Junkies open the album with 'The Way I Feel' and are joined by a cast of performers that include The Tragically Hip, who recreate 'Black Day in July,' Blue Rodeo, with one of Lightfoot's earlier songs, 'Go Go Round,' Murray McLauchlan, who essays a personal solo version of 'Home From the Forest.' and Bruce Cockburn who delivers a soulful version of 'Ribbon of Darkness' , the first Lightfoot 'hit' recorded by Marty Robbins. Other Lightfoot hits are here too: 'Sundown' (Jesse Winchester), 'For Loving Me' (Terry Tufts), 'If You Could Read My Mind' (Connie Kaldor) and the classic 'Canadian Railroad Trilogy' from Canadian folk hero James Keelaghan. The CD closes with a simple salute to the songwriter. 'Lightfoot' is sung by Aengus Finnan, a young singer who represents the new generation of Canadian songwriters who regard Gordon Lightfoot as an artist who broke boundaries by writing songs that were uniquely Canadian, and that remain influential, and enormously popular, today. Surprisingly, this is the first album that's paid tribute to Lightfoot's astonishing catalogue of songs - which are still available on almost 20 different albums. The salute is being announced a week after it was announced that Lightfoot has been appointed a Companion of the Order of Canada. 'Beautiful' has been executive-produced by Colin Linden, and will include a 20-page booklet. A special series of events is being planned to coincide with the release of 'Beautiful' in early October. Virtually all of the 15 artists pitching in on this Lightfoot tribute are Canadian, Maria Muldaur being the notable exception. Otherwise, the roster mixes some Canadian, or at any rate Canadian-based (in Jesse Winchester's case), icons like Cowboy Junkies, Bruce Cockburn, and Murray McLauchlan; more mid-level acts like Blue Rodeo, Ron Sexsmith, the Tragically Hip, and Quartette (with Sylvia Tyson); and a smattering of artists known primarily to Canadian audiences. It's very much in the mold of many respectable but rather dull tribute albums. Some are competently reverent covers that stay pretty faithful to Lightfoot's well-known arrangements. Others put mild spins on the familiar renditions without threatening to displace the supremacy of Lightfoot's interpretations. But it's tastefully done, without any unnecessarily lush overhauls or particularly gratuitous liberties taken with the compositions. And certainly many of Lightfoot's most celebrated songs come in for tribute here, including "The Way I Feel" (Cowboy Junkies), "Sundown" (Winchester), "Ribbon of Darkness" (Cockburn), "If You Could Read My Mind" (Connie Kaldor), "For Lovin' Me" (Terry Tufts), "Black Day in July" (the Tragically Hip), and "Canadian Railroad Trilogy" (James Keelaghan). Blue Rodeo's sprightly "Go Go Round," Cowboy Junkies' "The Way I Feel," and Cockburn's slow, languorous take on "Ribbon of Darkness" are the readings that come off best.